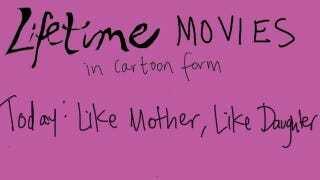 Lifetime Movie Cartoons: "Like Mother, Like Daughter"
In today's Lifetime Movie Cartoons, we examine the 2007 classic Like Mother, Like Daughter, a charming meditation on the inescapable allure of a man in power. Men in power, as we all know, are like Gods on earth. So what happens when the LMN writing team gets its nimble hands on such a creature? Murder, that's what.